Recently the two biggest phone companies released their new devices to the public. They are both pretty remarkable. If you plan on getting either of these phones, and are not sure which to upgrade to, here is a comparison. We’ll start with the key matchup with the often used camera. 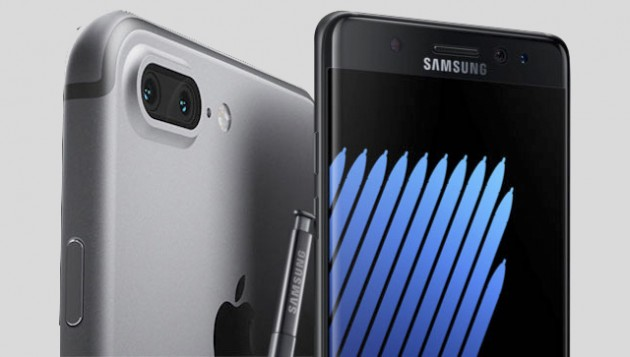 The iPhone 7 surprisingly made a huge jump and have the same camera as Samsung, who you usually has a major advantage in this category, with both having a 12 megapixel camera. One advantage that the iPhone does have over the Samsung is that after taking the picture, it still allows you to focus is on whatever you would like, rather than having to do it when actually taking the picture.In my opinion, I think iPhone wins this category. The next comparison is storage. With the past iPhones, the storage options were 16, 32, 64, 128,and 256 gb’s. Apple has finally removed the 16gb option, putting 32gb as the lowest storage option. On the other hand with Samsung, the lowest storage option is 64gb. Also, with the Note 7, it allows you to add up to 256gb with a microSD card. At the end of the comparison, with two of the most important factors, it’s a tie. So the real question is, are you Team iPhone or Team Samsung?